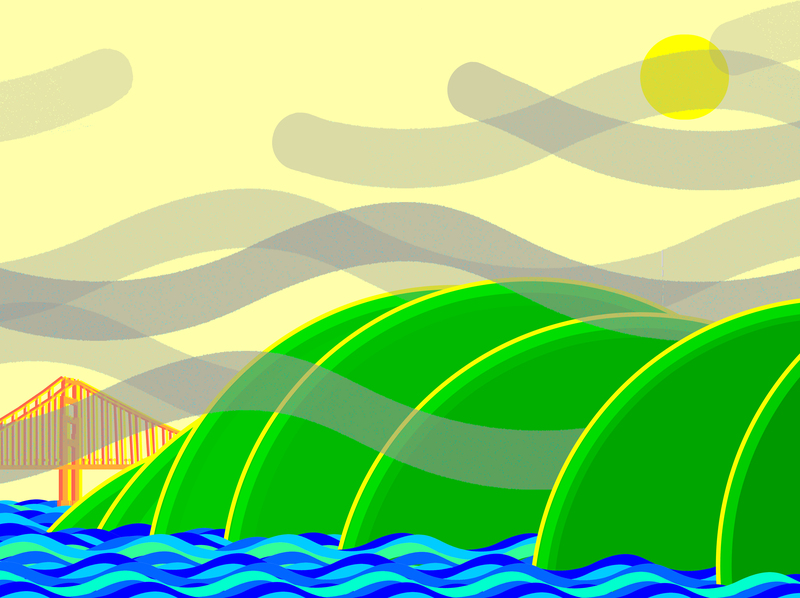 Thad Says Parts is Parts (And Thad is Right) takes place in San Francisco, and so, this is a stylized landscape of San Francisco – with Japanese-screen-like scrolls of tubular fog rolling over the early morning hills of the Presidio, the Golden Gate bridge in the distance, all on a winter morning. You can tell its Lands End because there’s no buildings visible – Baker and Marshall beaches would be just in front of us – we’re on the Pacific ocean looking Northwest onto the entrance to San Francisco bay, at Fort Point. The sun is low in the northern sky – so it’s probably winter.